If you are looking for a business opportunity in Oklahoma then the BBQ and grill cleaning business is a good place to start. Before you even think that this business requires a huge sum of money to be able to start, think again. You do not even have to worry that you have no experience at all in the world of BBQ grill and cleaning. The BBQ Cleaner will walk you through the entire process and will not charge a large amount in order to start this business. We do not even charge royalty fees because we are not selling a franchise. We also guarantee more customers for you because we have been receiving calls from a lot of people in Oklahoma who are in need of grill cleaning services. With people like you, we can reach to more families in the state and grow our name even more while you earn more money yourself. You can also work at flexible working schedules and service rates and with our help here at The BBQ Cleaner, you will be able to realize the business you have always been dreaming of. Why Start a BBQ Cleaning Business in Oklahoma? Weather is Favorable: Summers in Oklahoma are very warm while winters are mild. This means that people can spend more time outdoors doing what they love the most including grilling their food. Take this as an opportunity to offer grill cleaning services to residents. Plenty of BBQ Festivals and Activities: Apart from the fact that there are a lot of BBQ restaurants in the place, there are also a lot of BBQ festivals and activities all around Oklahoma. Many residents love grilling in their own homes too. All these people need BBQ and grill cleaning services. Little Competition: BBQ and grill cleaning offers little to no competition in Oklahoma. This will give you an easier way to penetrate your market. Scalable: Grow your business operations and feel the need to expand once you have established yourself. By then, you can hire more people or add more vehicles to service the needs of clients. How Does The BBQ Cleaner Help You Get Started in Oklahoma? We have a very attractive package indeed which also includes access to on-going lifetime business support from The BBQ Cleaner so that you can easily grow your business. Since 2009, we have managed to spread the good word and influenced more than 180 businessmen nationwide. The world of BBQ and grill cleaning have changed and we will make sure that through our help, you will be able to reach your dreams of earning more when it comes to grill cleaning services. 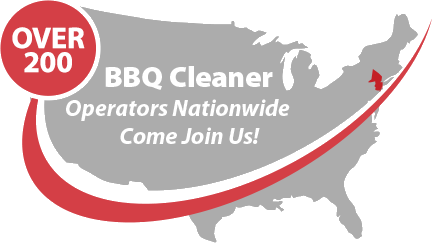 Talk to us today to find out more about this stellar BBQ cleaning business opportunity in Oklahoma!